Eighteen new double-sided map tiles evoke the opening scenes of Return of the Jedi, giving you access for the first time to Jabba’s palace, his pleasure barge, and iconic locations like the sarlacc pit. 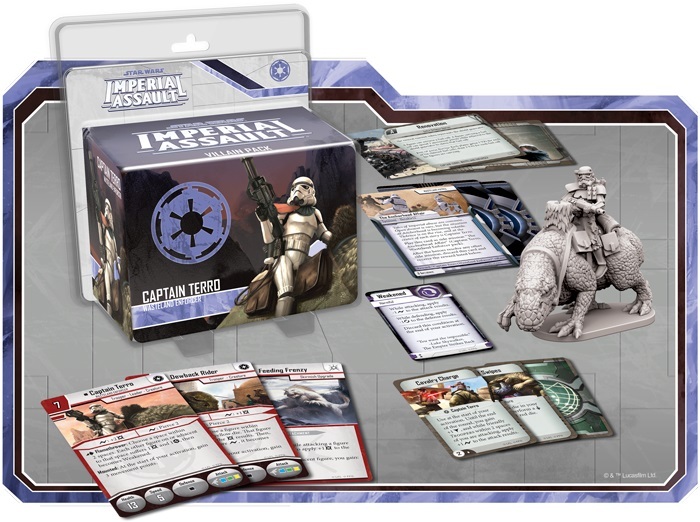 Meanwhile, sixteen brand-new plastic figures offer new warriors and heroes for the Imperials, Rebels, and Mercenaries, even as new Command cards, Deployment cards, Agenda cards, and Class cards give you countless ways to customize your game. 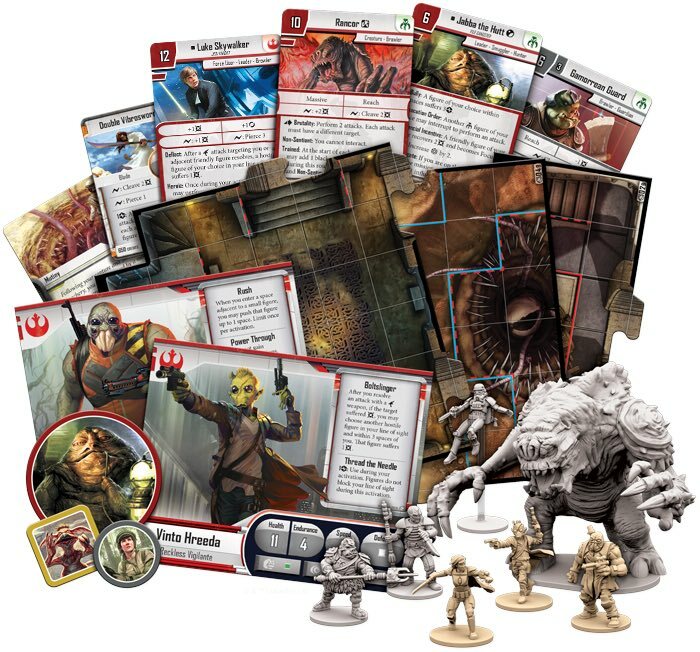 With characters like Jabba the Hutt, the Rancor, and Luke Skywalker as a Jedi Knight joining the game, this expansion draws you into the Star Wars saga like never before. For centuries, the Jedi Order endured as a symbol of truth and justice in the galaxy, with hundreds of Jedi Knights working to protect the innocent and safeguard the galaxy. The Galactic Empire gutted the Jedi Order, however, and by the events of Return of the Jedi, Luke Skywalker may be all that remains of that once legendary order. 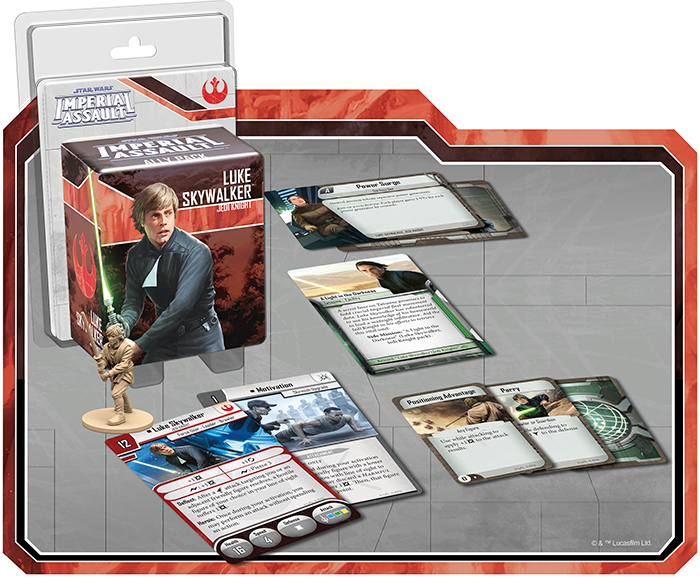 With the Luke Skywalker, Jedi Knight Ally Pack, you can bring a new version of Luke Skywalker into your Imperial Assault campaigns and skirmishes. A Jedi Knight with the skills of Luke Skywalker would be an undeniable boon to any Rebel strike team. You might end up using Luke’s knowledge of his homeworld to infiltrate an Imperial base on Tatooine, or you may bring him into one of your other missions as an ally. With his fully developed Force powers, Luke Skywalker can fight for the Rebel Alliance whether you’re playing the new full-length campaign in Jabba’s Realm, skirmishing against a hostile strike team, or playing any of your other adventures across the Star Wars galaxy. The soldiers of the Rebel Alliance are utterly devoted to the cause, willing to venture into even the most hostile terrain if it means helping to bring down the Empire. Although all of these soldiers are trained in battle, a few truly excel at guerrilla warfare and long-range attacks. These renowned snipers are known as the Alliance Rangers, and they can join your campaigns and skirmishes with the Alliance Rangers Ally Pack. 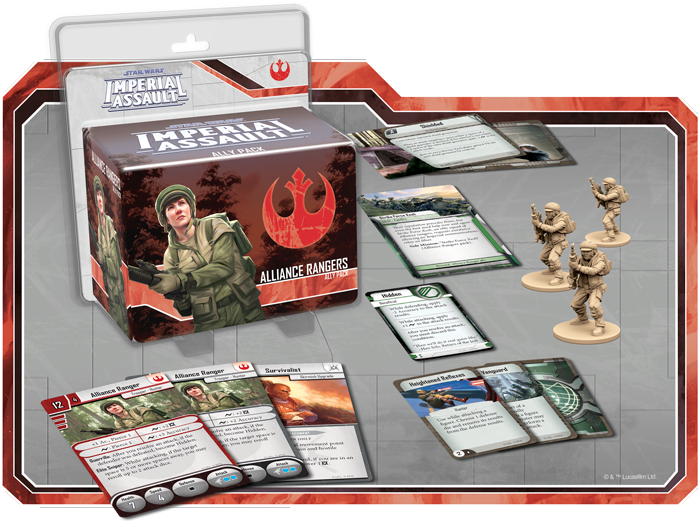 Alliance Rangers may help a small team of Rebel heroes survive among the dunes of Tatooine, or they may battle Imperial Stormtroopers under the canopy of a mighty forest, but wherever they’re deployed, these warriors are among the most deadly long-range fighters in the game of Imperial Assault. This Ally Pack comes with plenty of other ways to alter your campaign missions or skirmish games as well. You may travel to the planet Ithor to silence an Imperial recon facility, or move deep into the Nal Hutta Swamps and silently battle another strike team in the backwaters of the Hutt homeworld. No matter which way you prefer to play, the Alliance Rangers are a powerful asset for the Alliance to Restore the Republic. The Galactic Empire may technically control Tatooine, but on the planet’s surface, the rules are seldom determined by laws made light-years away. Crime is the closest thing to government that Tatooine has, and all crime on Tatooine feeds back to Jabba the Hutt. Jabba has spend decades establishing his criminal empire and crushing all competitors. Now, he can help to guide your Mercenaries strike team to victory with the Jabba the Hutt Villain Pack. 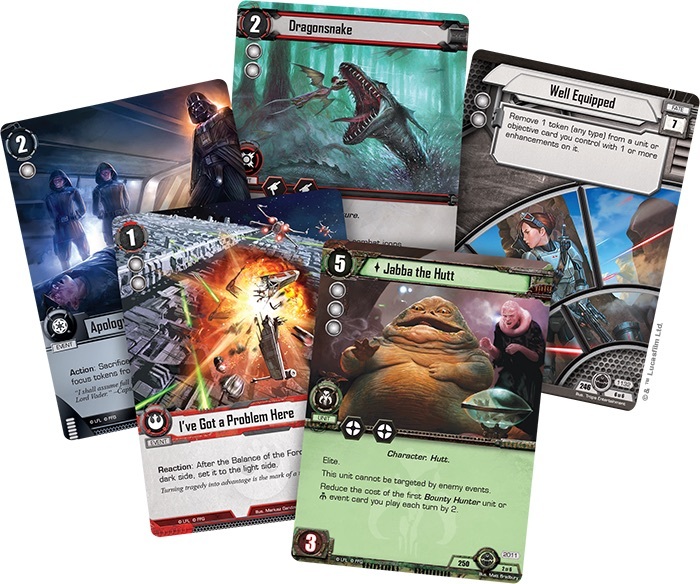 Three new Agenda cards invite you to spread the might of Jabba the Hutt across the Star Wars galaxy, even when the Rebel heroes venture beyond Tatooine itself. 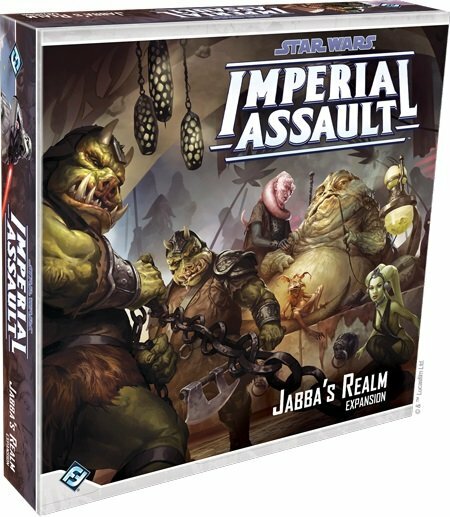 When he takes the battlefield himself, Jabba the Hutt offers a formidable presence in your campaign or skirmish. Though he prefers to stay out of direct combat and his great bulk makes it difficult for him to move quickly, Jabba excels at ordering his minions into battle and subtly undermining your enemy’s plans. 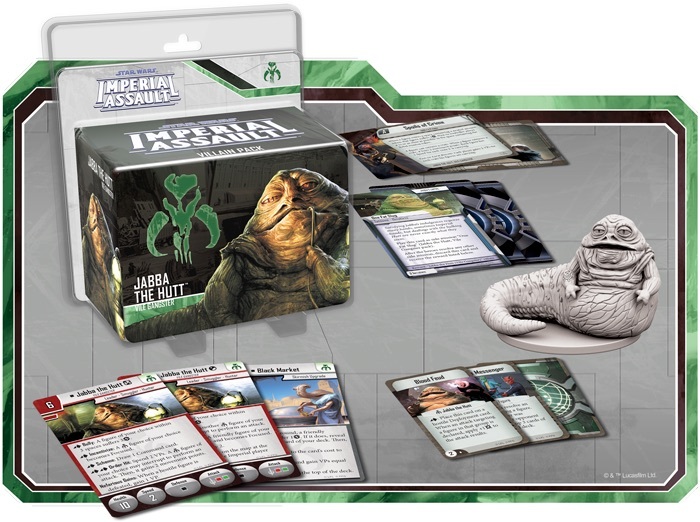 With this Villain Pack, your options for using Jabba the Hutt to control the crime world are nearly unmatched. 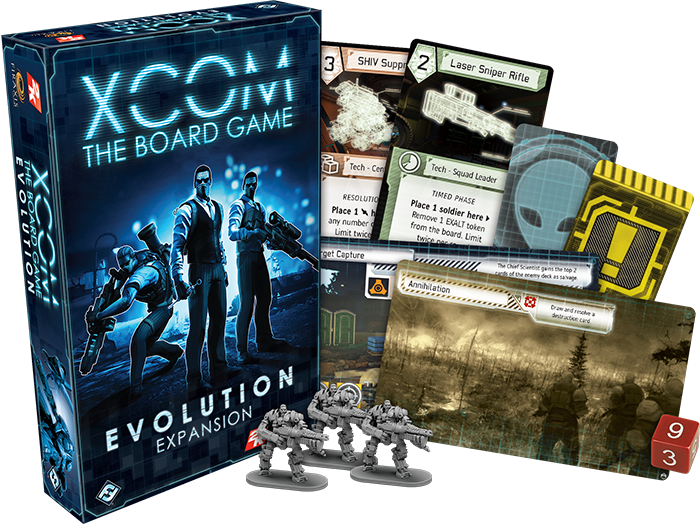 XCOM: Evolution is an expansion for XCOM: The Board Game that complicates your war effort with new missions, enemies, and invasion plans, as well as mechanics that make your struggles more dangerous than ever. As the alien forces spread and peril increases, the sinister humans of the EXALT seek to take advantage of the chaos to infiltrate and destroy XCOM from within. Their treachery leads to new challenges, and you’ll face new crises, you’ll find your work subverted, and you’ll have to deal with new threats to the very resources you need to win the war. Fortunately, your team has also made some advances since the war began. The discovery of the mysterious alien substance known as Meld promises to unlock some astonishing breakthroughs in the field of biomechanics. And XCOM: Evolution allows you to pursue some of these advances, potentially bringing formidable new weaponry to the field in the form of MEC Troopers! Throughout the saga, Star Wars has been defined by rivalries and conflict. Luke Skywalker, hero of the Rebellion, is opposed by Darth Vader, one of the Dark Lords of the Sith. Han Solo, a smuggler from the Outer Rim, is tracked by Jabba the Hutt and his teams of bounty hunters. Princess Leia Organa is taunted and questioned by Grand Moff Tarkin. 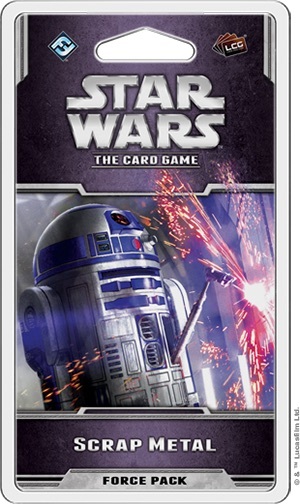 These enmities and threats bring the characters to life, and now, you can bring some of these rivalries into your games of Star Wars: The Card Game with Scrap Metal, the next Force Pack in the Opposition cycle. These products are all on store shelves now – go get em! ~ Which one’s your favorite?